Maybe it is strange to write a letter to yourself or maybe it is cathartic. 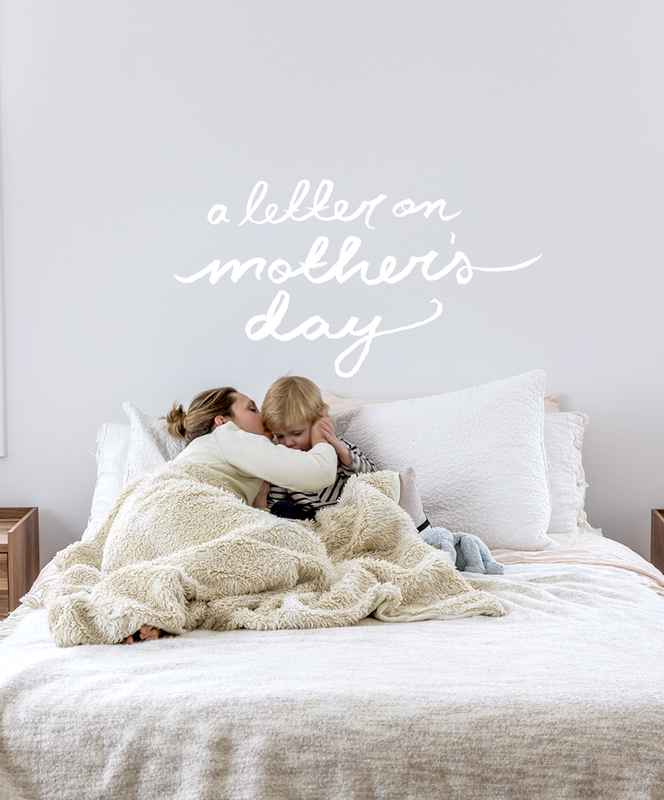 I am not sure, but on this Mother’s Day I felt I needed to write something to my present self in order continue on this journey of Motherhood. So entertain me for just a second here. The days of motherhood seem lighter don’t they? Do you think it is because the load changed or do you think it is because you feel the shoes finally fit? I am not sure if we will ever know, but it feels a little like both these days. Those early months were hard. At times we felt you may never get beyond them or they may crush you under the load. Many times it felt as if it was all you could do to keep your head above water. Being a mom was a role you always dreamed about it never quite felt natural till now. The guilt you felt at times about that was heavier than it should have been and it was quite self-induced. You know now that motherhood lays on some differently than others and that is okay, because we all end up finding our own way even though the experiences are too different. None of those challenges ever made you think twice about entering into such a duty in life. No role is more powerful or fulfilling is it? No job you have or award you will win will ever top what it feels like to raise a strong and compassionate human…no there is nothing. There are many things that didn’t go as planned and some that went wildly beyond expectations in these last 2 years. There is no word in the world to explain the depths of love you feel for that little boy or how you fell even more in love with Mike watching him be a father. The clarity that came with that baby arriving in your life was a gift you never expected. It changed everything and landed you and Mike on a hill back in the place that brings you both the greatest joy. He was meant to live on that hill and his presence brought you to this place. It wasn’t an easy journey and you still like to block out some of the days because of the challenge and exhaustion you felt, but nothing great in life comes easy. You know this well. Now that you are here and have watched your body come back to “normal” and have felt strong and whole again both mentally, creatively, and physically you know the time will come to tackle it again. It will look different. New changes will present themselves than before and you will push through something difficult again. There is no telling what it is, but you know after the shift of becoming a mother that you are capable of anything. You are capable of conquering the demons of postpartum or the physical challenges of recovery. You will emotionally come back again. You will find your footing in your career again. Maybe it will come easier or maybe it will be harder. That scares you. I know it does. It is okay to feel scared. You don’t know what will happen and that is never easy, but you know from these past few years you are better because of it all. In fact, I would beg to say that all of the beauty and difficulty left you a better version of yourself than you felt you possibly ever would be. Your passions are clear and you feel stronger than you did when you entered the journey. That solid ground is something you didn’t know before, but now you do. You have the support you need and you know better than to be fearful to speak up about saying I cannot do it alone. Just always remember motherhood is a journey and not a destination in life. You have big dreams, but you know that doesn’t mean they won’t come to be because of being a mom. You want to be there and to be present but you also want to show your children how to chase their dreams. There is nothing you want more than to represent what it means to be strong yet gentle and humble or how to live a life full of joy and creativity. So much of this is by example and you know it takes a lifetime to do this. You will always find a way to do this and know that it all happens in seasons. Some seasons you will be needed non-stop as a mom and work will fall to the backseat and other seasons you will be working more and your need as a mother will be different. Most of the time you will live in a world of finding balance. You know the way, just trust your gut and heart. It all goes quickly, but the key is living in the moment you are in and watching as the season shifts around you. This took you time to understand, but now more than ever you get it even if at times it is hard to find peace in these seasons. You have done well thus far and you should feel proud. It hasn’t been easy. It won’t be easy, but it is beautiful and you have never felt more love or purpose than you do right now. One day you know it will change. Your little ones will be off in the big world and you will be wishing these days back. The firsts and lasts will be far behind you and you will wish you could be back chasing that barefoot two-year old through the woods again. You will wish for the sleepy morning cuddles and the tiny hand desiring to hold your hand. You will realize all the while you were trying to chase career dreams that the real dream was unfolding right around you in those glistening eyes discovering the world right in front of you. The days on the porch drinking a glass of wine with Mike and watching the dogs and him play will feel like the best memories over the ones where we traveled to Europe or attended an exclusive event. The simplest things will feel like the big things and you will hold those closer than anything else. Your life won’t be full because of the things, but the moments of building snowmen together for the first time or showing that little guy how to the wonders of the woods. Life is full and beautiful even when it pushes you to the limit. Enjoy the fullness. Soak it up. It will change again and it won’t ever be the same, you know this. Enjoy it. As another Mother’s Day passes don’t worry about feeling celebrated, though you are worth it, you also know the greatest gifts you receive you already have and you feel celebrated every day because of the little things like the hugs and kisses or the tiny squished flowers. These are the gifts and I hope you never stop seeing the joy and beauty in them or the love they hold. Motherhood is your greatest role in this life and your heart will continue expanding through the years. You have room. You always will. Just remember to keep opening yourself up, welcoming growth, and remember you are the only thing that isolates yourself in this journey. Do not fear asking for help or saying you messed up. Faults are only faults if we never learn to grow because of them. Your imperfections are where you will always find the greatest room for love in your life. You still have a long way to go in this journey, but goodness just look how far you have come. For the first time you finally feel like you found yourself within a role you never knew how it ever fit. That is a big thing. Don’t forget it. What would you say to yourself as a mother? I would love to hear. Write something below if you would like. I think it would be amazing to hear. It’s totally worth it. though if I had known how great it is to be a mother, I would have had children much earlier. And yet, having waited until almost too late, I had a patience that was far greater than my ambition, and, having risen to be the boss and SEEN THE WORLD, I knew, more than I would have before having done those things, that motherhood was the greatest, most satisfying adventure I would ever have. I really loved reading this as a soon to be- first time mom. Enjoy your mother’s day! The letter is heartwarming. all moms out there should read it and remind yourself that you are worth every celebration not just once a year.